Hypertensive crisis is rare in children and is usually secondary to an underlying disease. There is strong evidence that the renin-angiotensin system plays an important role in the genesis of hypertensive crisis. An important principle in the management of children with hypertensive crisis is to determine if severe hypertension is chronic, acute, or acute-on-chronic. When it is associated with signs of end-organ damage such as encephalopathy, congestive cardiac failure or renal failure, there is an emergent need to lower blood pressures to 25-30% of the original value and then accomplish a gradual reduction in blood pressure. Precipitous drops in blood pressure can result in impairment of perfusion of vital organs. Medications commonly used to treat hypertensive crisis in children are nicardipine, labetalol and sodium nitroprusside. In this review, we discuss the pathophysiology, differential diagnosis and recent developments in management of hypertensive crisis in children. A 5-year-old female had a living donor kidney transplant. Seven days after the transplant she had a seizure. Her blood pressure was 170/120 mmHg, and her serum creatinine was 0.8 mg/dl. Calcineurin inhibitors were started on the third post-transplant day, and she was also started on mycophenolate mofetil. She is polyuric. What would you most likely expect to find upon investigation. 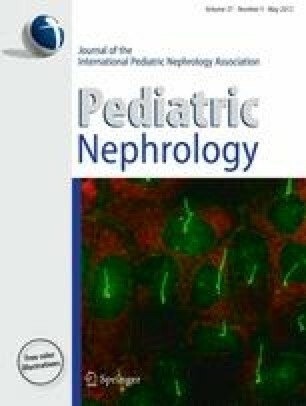 An 8-year-old male has ESRD and is on hemodialysis. He had severe hypertension which improved with aggressive fluid removal and re-adjustment of his dry weight. His hypertension was managed with β blockers, clonidine and a calcium channel blocker. Blood pressures are now generally 110/80 mmHg. Which of the following would you consider as the next step.